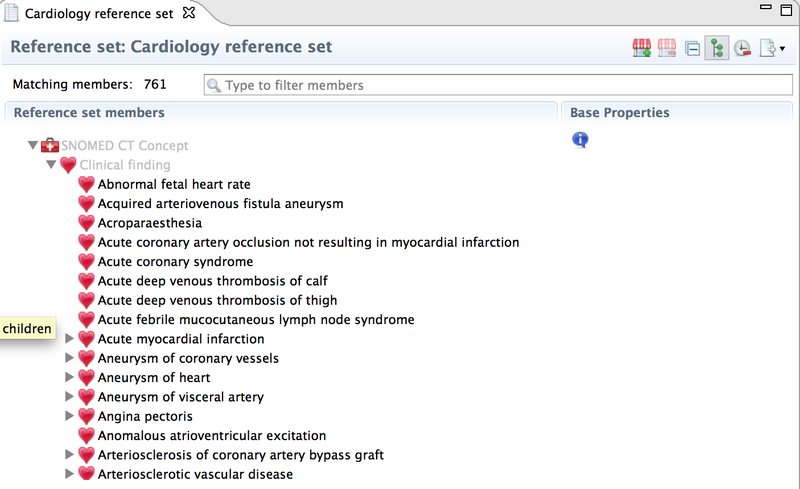 For working with the reference set members you need to open the reference set in an editor where the list of members can be viewed in a table. You can open a reference set similarly as a concept: by double-clicking on it in the Reference Set view. 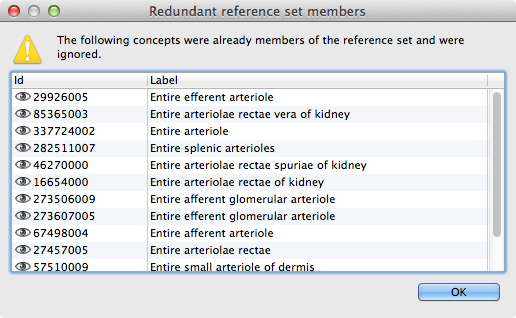 By default, the reference set editor displays members in a hierarchy. A toggle button allows switching the view between hierarchical and flat list modes. 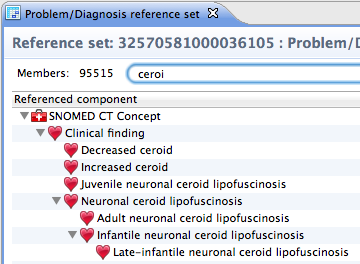 Note: The hierarchical view is not available for reference sets with descriptions as referenced components. Click on the clock button to show or hide inactive members. If want to see more information about a concept, you can click it once, which will display the first page of the concept editor in the section to the right. 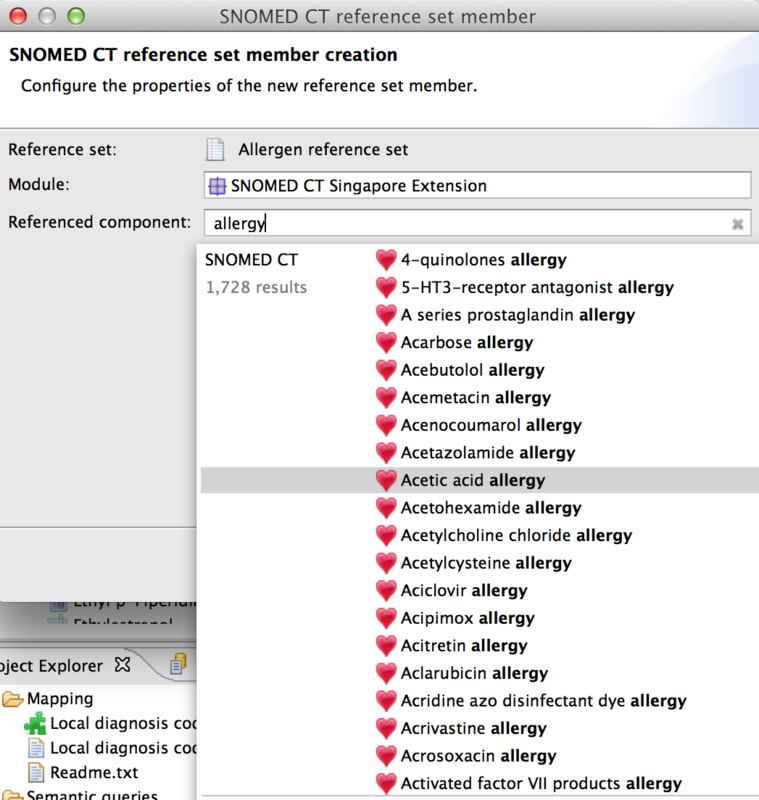 You can also open the full SNOMED CT concept editor by double-clicking a concept. 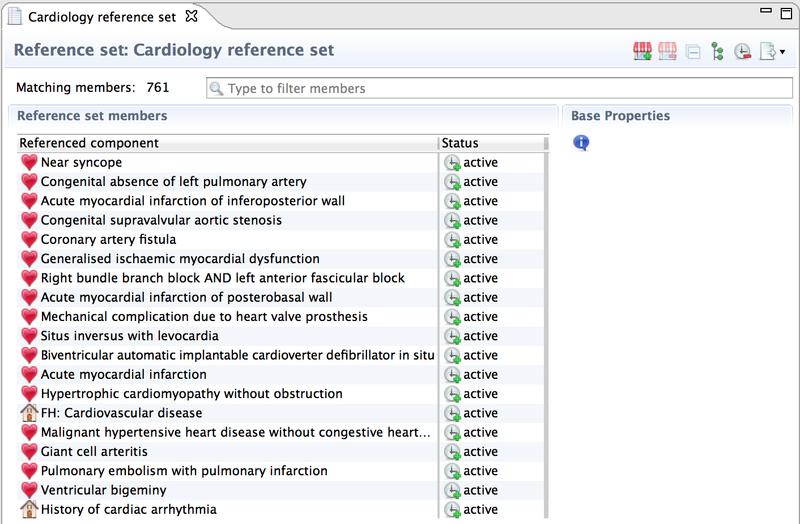 The reference set editor allows filtering the members displayed in either the table or tree views. Members can be added to a reference set from the editor or from the view. After adding the members to the editor the small asterisk in the header indicates that you have unsaved changes. Make sure you save the reference set. The wizard can be invoked from the Add member button in the editors toolbar. Click in the text box or enter a term to bring up the integrated quick search. When adding a member to a query-type reference set, you need to browse for the query file. You can also add a member directly from the concept navigator or from the search results: Right-click on the concept and select Add concept to active reference set from the context menu. It will be automatically added when it's a simple type reference set, or open the new member wizard and populate it with the selected concept at the simple map or the attribute-value types. For the query specification type reference set you can select an ESCG file from the project explorer, choose 'Add to reference set' from the context menu to open the wizard. Please note that this selection methods are only enabled when there is an active reference set editor of the proper type. 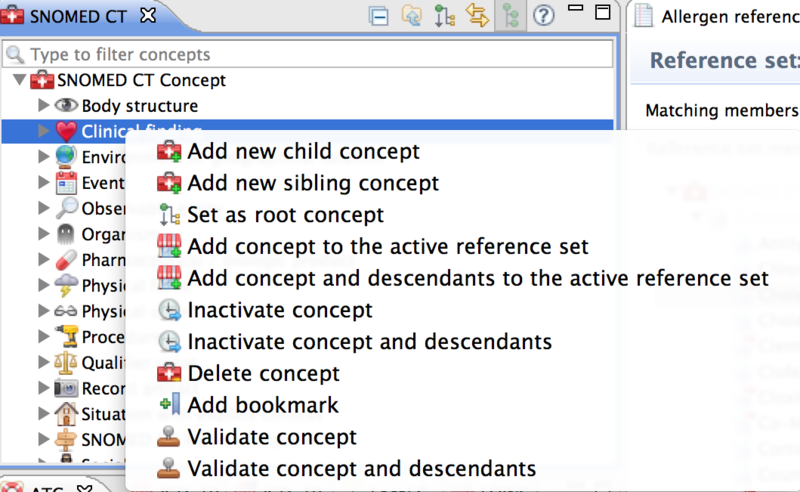 If you want to add several concepts at once, you can use the batch selection: You can add an entire hierarchy by right-clicking its root in the tree and selecting Add concept and all its descendants to the active reference set. It is also possible to add a set of search results (regardless of the type of the search) by right clicking one of the results in the search view and selecting Add all results to the active reference set. Note that at the attribute-value type and the simple type reference sets this action will add the same value or map target to all of the referenced components. Adding members to a reference set that has description as the referenced component can be done by running a description search and right-clicking on the resulting descriptions. If a referenced component is already present in the reference set, a warning is displayed. Inactivation: Inactivating a reference set member will keep it in the database with the status: inactive. This is the action to take at released reference set members that become deprecated but cannot be deleted, or at non-released members where the status will be likely to be set back to active in the future. Also: if the referenced component is inactivated, that will not result the reference set member to be automatically inactivated, that has to be performed manually. Deletion: Deletion temporarily removes the member from the database and cannot be undone. When you want to delete a deprecated reference set member you need to keep in mind that the referenced components will not be deleted. However, if one of the referenced components are deleted, the associated reference set member will be automatically deleted too. You can delete a member by selecting it in the table and clicking the Remove member button. Right-clicking on the reference set member also allows you to delete either just the single member, or the member and all of the referenced component's subtypes. 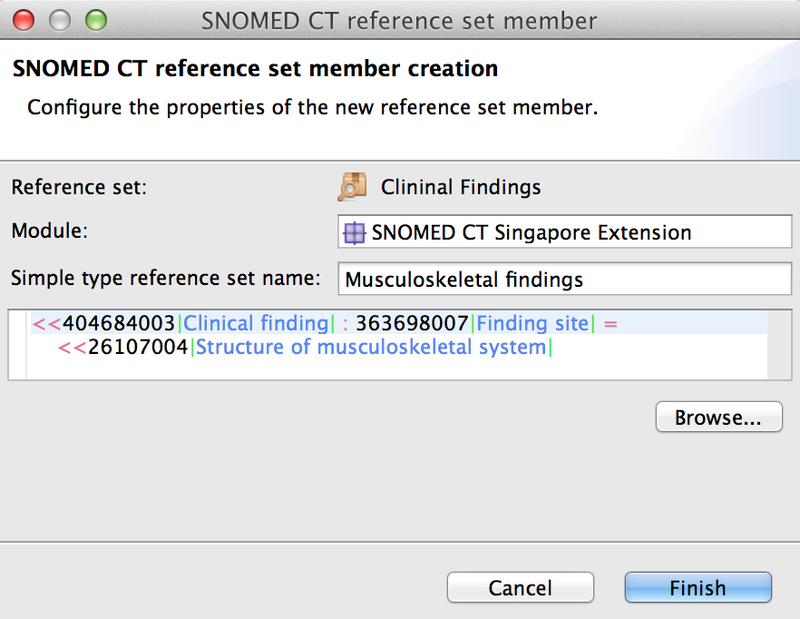 If you want to delete an entire reference set with all its members you need to delete the reference set identifier concept from the SNOMED CT concept hierarchy. You may want to have an alternate view of the reference set members: instead of having them grouped by reference set, you would rather look through the reference memberships of a referenced concept? The concept editor contains three different tabs where you can review the references made on that concept or any of its associated components (eg. descriptions). These tabs are read-only, you can edit the reference set members on the Reference set editor.